A writing instrument collection in limited production inspired by the biggest continent on Earth.Dedicated to the Asian continent Aurora has created these precious writing instruments as a tribute to the Asian culture and to its fascinating symbology.This collection in limited production consists of 7.500 pieces numbered fountain and ballpoint pens, 5.500 rolling ball pens, 2.500 mechanical pencils and of only 999 pieces of the Sketch pens.The cap, with a valuable green jade stone studded on its top, is fitted with a jewel clip engraved with the profile of the Asian continent.Both the cap and the barrel are made of the marbled “Land of Orient” resin, an exclusive refined Aurora material, featuring refined light nuances.Famous symbols inspired to the Asian culture have been chiselled on the enamelled ring, hand painted with golden and burgundy finishings. 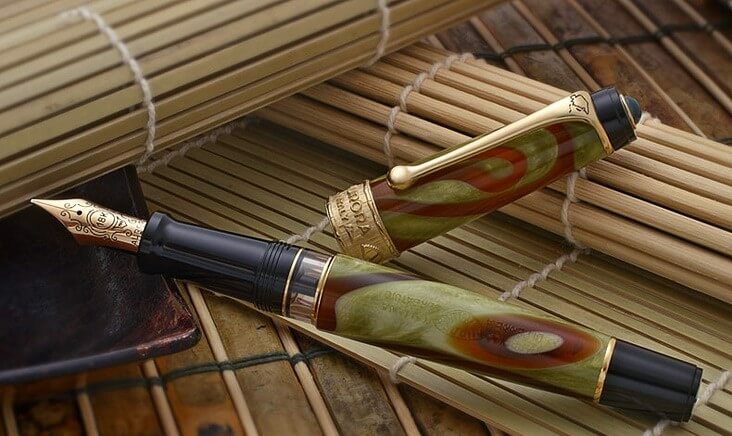 The Buddha, sign of wisdom and spirituality; the Lotus Flower, sign of purity and rebirth; Yin and Yang, icons of the spiritual unity; The Pagoda, symbol of the universe and finally the Fan, which represents the power.The fountain pen is fitted with a 18Kt. solid gold nib and with the filler piston system with hidden ink reservoir. The ballpoint pen is a twist action as the mechanical pencil, whose rotating mechanism allows a progressive and controlled release of the pencil leads. The roller is also available: its smooth writing stroke will make you feel again the joy of writing. Finally the sketch pen is the suitable tool for artists and the perfect gift for classy people in its black calf leather pen pouch and its refined brass made desk pen stand.These valuable writing instruments are packed in a splendid box made of a marbled green leatherette, wrapped in a cardboard sleeve, decorated with some oriental-style images.